New Delhi: BJP President Amit Shah Tuesday kicked off his party’s ambitious “Mera parivar, Bhajapa parivar” campaign by hoisting its flag at his residence in Gujarat as it seeks to cover over five crore houses under the drive ahead of the announcement of the schedule of Lok Sabha polls. The exercise will last till March 2 and the saffron party aims to plant its flag at five crore homes of its workers and sympathisers across the country. 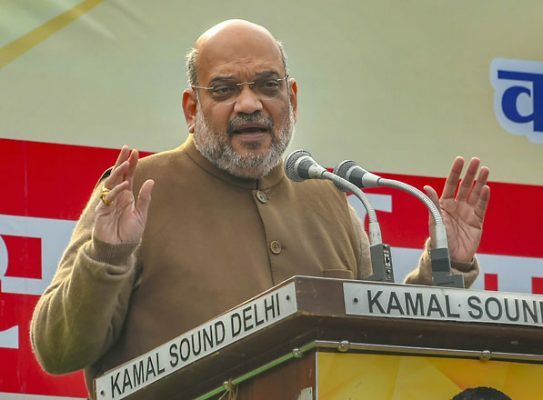 “This BJP flag is a symbol of development, belief and nationalism, and shows how appeasement, casteism and family rule is ending in the Modi era,” Shah said, launching the campaign. A large number of party leaders and workers joined the campaign and shared pictures on social media platforms. BJP sources have described the drive as a part of its mass mobilisation campaign for Lok Sabha elections, expected to be held in April-May, claiming it may touch up to 20 crore people if a house has on an average four residents. “The BJP had received over 17 crore votes in 2014. Now we have details of of 9.5 crore members in our record. There are 35 crore beneficiaries of Jan Dhan bank accounts, seven crore under Mudra and over six crore under Ujjwala scheme to give free LPG connection to the poor,” a leader said.